If you are in Ho Chi Minh City or Hanoi a great way to spend a few hours in the evening is to visit a traditional Vietnamese water puppet theatre. These are the only water puppets in the world, and they are magical! 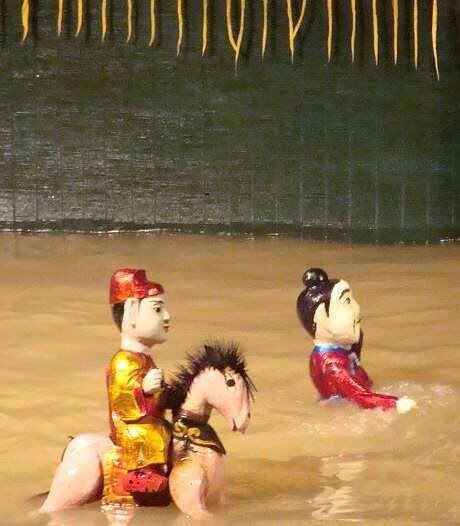 The water puppets, known in Vietnamese as múa rối nước, represent an ancient art. They have their origin in North Vietnam around Hanoi in the Red River Basin, the flat plain formed by the Red River and its tributaries joining in the Thai Binh River. Historians believe that some form of the theatre originated as early as the 11th century in this area, and it is only more recently that it spread further south with one of the main performance venues now being in Ho Chi Minh City (Saigon). Traditionally, however, it was found only in northern and central Vietnam, The Thăng Long Puppet Company (Nhà hát Múa rối Thăng Long) of Hanoi explains that puppet troupes were formed as local guilds that zealously guarded their secrets. Puppeteers were limited to males who passed their skills down to their sons. This meant, however, many secrets of the art were lost due to travel away from home villages, early deaths, and other causes that disrupted transmission. The relationship of today's theatre to that of the 11th century is debatable, but no doubt it has undergone significant changes as has Vietnam itself. 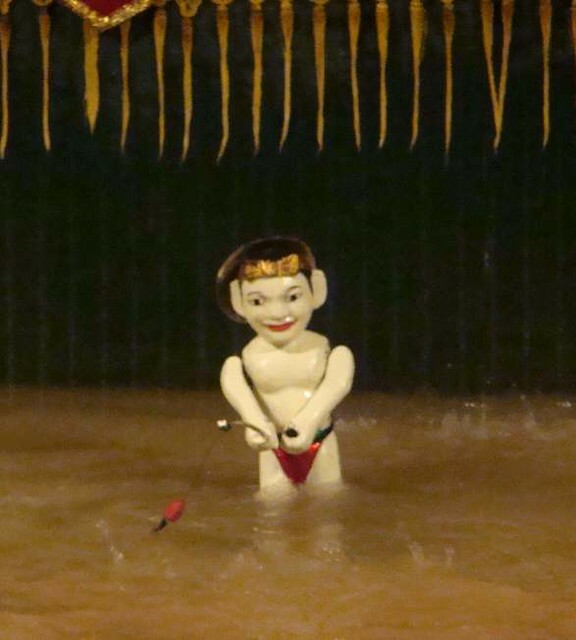 In former times, the ponds and flooded rice paddies after harvest were the stage for these puppet shows. It is said that the puppeteers had noticeably shorter lives, the assumption being that they acquired parasites from standing in the waters for so long (the Vietnamese then, as many do now, used human waste as fertilizer, facilitating the life cycles of many parasites that depended on human hosts). Now most performances take place on specially designed stages, or for touring groups, portal tanks--not rice paddies fertilized with human feces! Up to 8 puppeteers stand behind a split-bamboo screen, decorated to resemble a temple facade, and control the puppets using long bamboo rods and string mechanism hidden beneath the water surface. Many of the puppets can be quite heavy, up to 15 kilos (30 pounds) or so, so holding them up away from the puppeteers body is physically strenuous and might account for why puppeteers were traditionally all male. The puppets are made of enameled wood, and many of them are capable of quite complex manipulations from turning of the head, moving their arms to casting fishing lines or checking fish traps. Because the puppets were constantly immersed and exposed to water, very few earlier puppets survive and they have short lifetimes compared to some other traditional Asian puppets, such as Japanese bunraku puppets, many of which have been in use well over two hundred years, or wayang kulit puppets of Indonesia and Malaysia, many of which are approaching a century in age. Twenty to thirty years is a very good lifespan for a Vietnamese water puppet. A traditional Vietnamese orchestra provides the music accompaniment for the performance. Its instrumentation includes vocals, drums, wooden bells, cymbals, horns, Đàn bầu (monochord), gongs, and bamboo flutes. The bamboo often accompanies puppets of royalty or high status while the drums and cymbals are used for exciting and dynamic scenes such as a dragon's entrance. The puppets story is told by a traditional North Vietnamese opera choir called chèo who often voice over the puppets' actions. However, the musicians sometimes add vocals as well, such as shouting to a puppet to watch out. One imagines that in traditional performances audiences may have participated in the same way, shouting our their encouragement or expressing their consternation with the puppet's antics. Event though performances are in Vietnamese, foreign audiences will still appreciate the puppeteers skills and be able to laugh at their antics. Among these performances, the most interesting are probably the dragons spurting fire and water or the synchonized "fairy dance" in which the puppets inexplicably seem to cross paths. How is water spurted out from dragons with multi-sectioned bodies? How to set off fireworks when dragons are in the water? How do puppets on bamboo poles and strings cross paths? 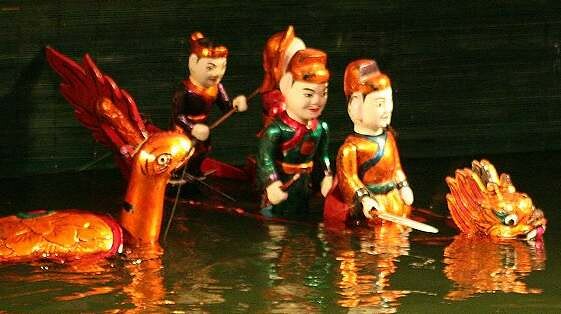 They are wonderful secrets from the hundred-year experience of Vietnamese water puppetry. There are two main venues for water puppet performances today and both are very popular with domestic as well as international tourists. The Golden Dragon Water Puppet Theatre puts on two nightly shows at 5:00 and at 6:30. The shows are 50 minutes long with no intermission and are completely performed in Vietnamese although multilingual programs are available. The theatre is located about a 10 minute walk from the Ben Thanh Market and is just a couple minutes from the Independence Palace. 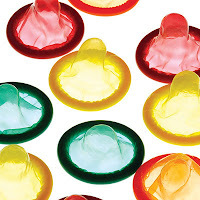 It is located at 55 Bis Nguyen Thi Minh Khai Dist. 1 in Ho Chi Minh City. You must book at least one day in advance to get a seat during most times, and it is not unusual during high season for performances to be fully booked three and four days in advance. Your hotel or guesthouse can usually make a booking for you. The Thanglong Water Puppet Theatre has five performances each day at 4:00, 5:15, 6:30, 8:00 and 9:15. Show are about 50 minutes long with no intermission. The performances completely performed in Vietnamese although multilingual programs are available here as well. The theatre is located at 57b Dinh Tien Hoang Str., Hanoi and is well known. You should definitely book in advance as the Thanglong shows are even more popular than its southern cousin, and you should try to book two days in advance whenever possible. Again, during high season performances sometimes fill up three or four days in advance despite the multiple showings. Also be aware there is a separate camera fee and a video fee; the latter is the same price as you pay for admission.